The NICE Adaptive Workforce Optimization initiative has enhanced its workforce management technology portfolio with the October 11th acquisition of WorkFlex Solutions, the Cincinnati-based software company founded in 2009 by two veterans of the contact center industry determined to fix an ever-present problem that presents contact center management with headaches: intraday staffing imbalances. Workforce management (WFM) systems had evolved into sophisticated, feature-rich enterprise support technologies delivering forecasting and scheduling capability, but they were still missing the functionality to handle sudden changes in call volume and the accompanying need to staff up or down efficiently with right-skilled agents. Now this intraday staffing gap with its WFM-system-agnostic Intelligent Intraday Automation® solution is closed. NICE recognized the value this new approach brought to the WFM market and became a WorkFlex OEM partner in 2015, offering its WFM customers the technology under the label Employee Engagement Manager (EEM). With the WorkFlex acquisition, EEM has become an integral component of the NICE Adaptive Workforce Optimization program. While WFM systems recognize staffing imbalances and broadcast these to workforce management, they fail to implement a solution or even identify solution options. EEM pulls data from the WFM and ACD systems, and data from the company-specific configuration of business rules that the EEM administrative interface enables every enterprise to customize to company requirements, and filters these through the proprietary EEM decision engine every 30 minutes. Workforce managers then see recommended solutions on their dashboard and can, if they choose to, apply them with the click of a mouse. EEM executes the solution steps automatically, eliminating the need for the time-consuming manual steps normally associated with staffing adjustments. The result is a reduction in staffing variances, or put another way, the achievement of optimized net staffing, that ever-elusive metric coveted by contact center management teams the world over. In short, the EEM system adapts to changing conditions in pursuit of optimal conditions. Once set into motion, the EEM solution sends messages to the employees (agents) the system has selected via their preferred contact channel. They have already set preferences regarding when they are willing to be contacted and how they wish to be contacted for schedule changes (text, email, or, at work, desktop message). Depending on whether the contact center is experiencing conditions of over- or understaffing, the message inquires if they would like to take available time off (paid or unpaid) or work available extra hours. Agents accept or reject the proposal within the indicated time frame and EEM automatically updates the WFM schedule. If not enough agents accept the schedule change, the system sends out a request to a different set of agents and continues the process until the staffing level is acceptable, or all eligible agents have been contacted. The process described above is company-initiated and takes place through the Manager Module, but the real “magic” of EEM lies in the agent-initiated contributions to optimized net staffing that occur via the Agent Module. Through either a browser window or a native mobile app, agents can access an agent portal that permits them to self-manage their work schedules. 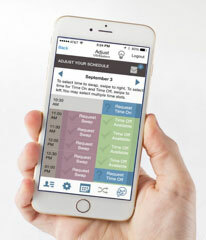 For up to four weeks out, agents can view the contact center’s overstaffed and understaffed intervals and select intervals for time off or overtime themselves. Gamification capabilities allow them to earn points by taking hard-to-fill work hours and use these for time off. They can also swap time with themselves or trade hours with other agents. They can even change work activity. Time intervals that appear in green are preapproved by the system and agents receive immediate approval when selecting these. Time intervals shown in blue indicate over- or understaffing conditions are too close for automatic approval and require workforce manager review. What is essential and unique in this process is the concept of the agent as workforce management partner who assists directly in addressing changing staffing conditions. Each agent-initiated change helps balance staffing, so the more changes agents make, the more optimized net staffing. With Millennials, a generation valuing schedule flexibility and work-life balance, now predominating in the agent workforce, this level of dynamic work-hour self-management becomes a recruiting and retention tool contact centers can wield for a competitive edge as they battle Lyft, Uber, and other denizens of the work-when-you-want-to “gig” economy toward which Millennials often gravitate. EEM thus not only adapts to the changing conditions in the contact center, it adapts to employee needs/wants by engaging them via the agent-specific features and empowering them to exercise control over their work schedule. A key characteristic of the EEM solution is its industry-unique capability profile. No other technology currently available matches EEM functionality. Four patents make it unlikely that equally feature-rich, competitive technologies will appear on the market. (See chart below). Each of these addresses structural processes in the technology and establishes exclusive EEM functionality. That functionality will expand as NICE develops the product further in answer to industry demands and evolving workforce management paradigms. NICE is committed to continual enhancement of NICE Adaptive Workforce Optimization to improve the contact center experience for the customer, employees, managers, and the enterprise; EEM is a dynamic tool in the NICE technology arsenal that will help the company pursue that objective going forward. For more information please contact Paul Chance, Senior Product Marketing Manager, NICE at 972.523.5423 or Paul.Chance@nice.com.